This year at Dayton, as the flea market was concluding on Sunday and I was hunting for last-minute bargains, I came across a few non-functional Bird 43 slugs in one of those "Everything $1" bins. My first thought - I'll repair them. As it turned out, they were for frequency/power range I had no interest whatsoever. So what one can do with a damaged Bird 43 slugs besides repair? A few things actually - it makes nice dummy slug for the Thruline section, it can be reworked into a RF sampler or just keep them for parts. The original aluminum dummy slug could actually be improved on - it has a small design flaw IMHO - when inserted, it keeps the contact finger of the Thruline section pressed and under tension. This might lead to metal fatigue and eventually the contact finger could loose its spring action, causing poor electrical connection with the slug. Once, I saw a third party "dummy slug" where this issue was addressed with a shallow groove allowing the contact finger to rest. The normal Bird element already has two small lateral indentations on each side where the contact points are protruding. First I "gutted" the slug, completely disassembling it and removing everything from inside including the internal contact plate. This was simple enough and left room for the contact finger of the Thruline section to rest without pressing onto anything. But why stop there? How about a hygroscopic dummy slug to absorb trapped moisture inside and to keep the Thruline cavity nice and dry? I sealed the two contact point holes of the slug with copper/kapton tape from the inside. Then I made 6 small holes on the bottom of the white Teflon cover (which normally protects the coupling circuit). I reinstalled the Teflon cover on the slug, pressing it until it snapped into place. 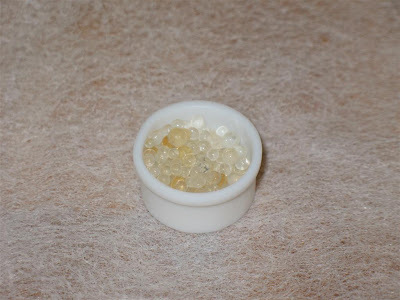 Silica-gel is very easy to find - people normally discard the Silica-gel bags after they buy a pair of new leather shoes or a hard drive - I collect the little Silica-gel bags in a jar and re-use them. Re-cycling Silica-gel is also easy - the Silica-gel needs to be "baked" for about 2 hrs in a toaster oven on "high" (250 - 300 F). This process will evaporate the moisture absorbed by the beads and the batch will be as good as new, ready to absorb more moisture again after it cools down. The new dummy slug is lighter, preserves the contact finger of the Thruline section, absorbs moisture and keeps the cavity dry and most importantly - makes a cool rattle sound when you shake it :-) Not bad for $1. Update: Another idea for enhancing the functionality of the "dummy slug" even further - small piece of felt/cloth/foam can be attached inside each contact bed of the slug. Then, (optional) a drop of Deoxit D5 solution can be used to moist this "cleaning pad". Each time when the slug is inserted or removed, it will wipe clean the contact finger. In addition, instead of using only silica-gel beads, the dummy slug could be filled with a mixture of silica-gel and activated carbon. (another option, if moisture is not an issue, is to replace the silica-gel entirely with activated carbon). The activated carbon will absorb any sulfuric gasses in the air (like hydrogen sulfide) - sulfur is the main cause for the black tarnish on silver/silver-plated surfaces (the Truline cavity is silver-plated). My call sign is SP9EJH and I have bought Heathkit amplifier SB201. Rotary switch meter is out of order so I need new one but cant find it. I olso want to buy new main rotary switch to add 10m band. Cant you help me to buy this parts? Worthless. The original dummy slug is to shunt the meter movement. It was designed to make contact with the contact finger to provide this function. Also, moisture is never a problem with these meters. A complete waste of time.. IMHO. The metal body of the dummy slug is grounded, (either by a contact with the sides of the receptacle or by the latch) providing sufficent shielding to the contact points and there is absolutly no need shunt the meter system. The small contact points can not pick up enough energy even without a shield and even in the kW range - I've used the meter with no slug and 1 kW going thru. As for the moisture - it all depends on the evironment - in my shack humidity raises in the summer and the humid air gets traped in the cavity, where it condenses. One could also fill the slug with activated carbon to absorb sulfuric gases ( the main reason for the tarnish on silver surfaces) - I've seen more than one Thru-line devices completly tarnished on the inside. Lastly, I never had an "original" dummy slug - so if you own one - use it - I just used what I had in hand - a couple of slugs not worth the repair.